"24K Magic" "This Is America" A Grammy Award (stylized as GRAMMY, originally called Gramophone Award), or Grammy, is an award presented by The Recording Academy to recognize achievements in the music industry. The annual presentation ceremony features performances by prominent artists, and the presentation of those awards that have a more popular interest. 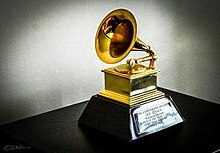 The Grammys are the second of the Big Three major music awards held annually (between the American Music Awards in the Fall, and the Billboard Music Awards in the Summer). ↑ Williams, Nick (February 13, 2016). "And the Grammy Comes From...". Billboard. 128 (4): 56–57. ↑ Sisario, Ben (June 5, 2009). "Polka Music Is Eliminated as Grammy Award Category". The New York Times. The New York Times Company. p. C5. Retrieved October 18, 2010. ↑ "Grammy Awards Voting Process". Retrieved January 17, 2014. ↑ Travers, Peter. "Grammy & The Movies". Rolling Stone. February 8, 2008. ↑ Martens, Todd (February 6, 2008). "Glen Hansard, Eddie Vedder crash Grammy Awards". Los Angeles Times. Archived from the original on February 21, 2013. 1 2 Roberts, Randall (November 30, 2011). "Critic's Notebook: Grammy Awards? Your granny's awards". Los Angeles Times. Retrieved December 1, 2011. 1 2 Touré (December 2, 2011). "Touré: Why The Grammys Snubbed Kanye West's Twisted Fantasy". Time. Retrieved January 31, 2012. 1 2 3 Caramanica, Jon (December 2, 2011). "The Bon Iver Grammy Quandary". The New York Times. The 6th Floor. Retrieved December 5, 2011. ↑ Lee, Amy (February 13, 2012). "Grammys 2012: Bon Iver Wins Best New Artist, Feels Conflicted About It". The Huffington Post. Retrieved February 14, 2012. 1 2 Caramanica, Jon (February 13, 2012). "At the 54th Grammy Awards, Everything Old Is Praised Again". The New York Times. Retrieved February 14, 2012. 1 2 Stoute, Steve (February 20, 2011). "Steve Stoute: An Open Letter to Neil Portnow, NARAS and the Grammy Awards". The Huffington Post. Retrieved February 14, 2012. ↑ Kornhaber, Spencer (February 13, 2017). "Adele, Beyoncé, and the Grammys' Fear of Progress". The Atlantic. Retrieved March 25, 2017. ↑ Porter, Rick (February 11, 2019). "'Shark Tank' and Grammys pre-show adjust down: Sunday final ratings". Retrieved February 23, 2019. ↑ Porter, Rick (January 30, 2018). "'Shark Tank' and Grammys pre-show adjust down: Sunday final ratings". Retrieved August 18, 2018.